Five Flower Rescue Remedy is a combination of essences that is used in emergency situations to stabilize trauma situations. It eases fear and restores one’s state of calm and confidence. However, it is not intended to replace emergency care or assistance. This First Aid formula of flowering Herbs was originally combined through the studies of Dr. Edward Bach, a homeopathic practitioner who pioneered working with subtle flower energies. Dosage: Ten drops in glass of water or juice, sipped as often as needed. If the person is unconscious or unable to drink the formula can be rubbed directly onto soft tissues of the body, lips, temples, inner wrists, etc. 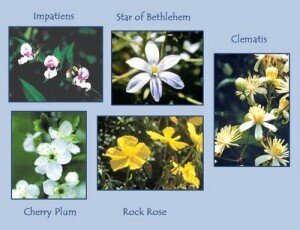 Star of Bethlehem This essence is a restorative remedy for calming anyone who has experienced shock or trauma. Rock Rose This remedy is recommended in the event of life threatening emergency. It calms the individual when experiencing extreme panic, terror, or hysteria, restoring strength and courage. Impatiens This essence remedy addresses metal stresses and tensions. It calms feelings of impatience and irritability. It slows the tendency to move to quickly without care or forethought. Calming. Allows one to deepen his/her life experience without experiencing burnout. Cherry Plum This essence addresses emotions of desperation and loss of control. This remedy helps one re-connect with a higher power when the tensions and pressures of life are overwhelming. It brings mental calmness and emotional encouragement, allowing stresses and fears to be overcome. Clematis This remedy brings about focused awareness. It retards floaty or dreamy escapes. It is a grounding essence that wakes up the individual to better evaluate the present situation.